View the entire table of contents for the Nov. 30, 2009 issue. Today the Mina Group encompasses 15 restaurants across America. Four hold Wine Spectator's Award of Excellence, nine have the Best of Award of Excellence, and Mina's eponymous restaurant in San Francisco has held a Grand Award since 2005. The kitchens show distinctly different personalities, and many rate among the best in their respective towns. At the age of 40, Mina heads the brightest collection of new American restaurants to emerge in this decade. Revenues for the restaurants reached $94 million in the past year (that total is shared with partner hotels). Even in the currently rough state of the economy, Mina's restaurants, all of them upscale, feed more than 30,000 people each week. 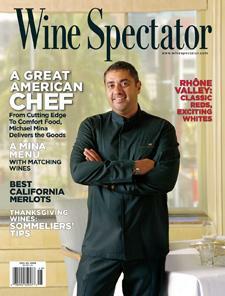 For the full article, check out the new issue of Wine Spectator, on newsstands November 10, 2009.